People who plan to slim down usually would like to get appetite suppressants to help them curb hunger and reduce weight. But how do you know that such appetite suppressants are good for you? Rx appetite suppressants can be a right choice for morbidly obese patients under doctor's guidance but due to their negative side effects, and they are not recommended for a cosmetic weight reduction. So, unless you're a morbidly obese patient, prescription appetite suppressants may not be good for you, and you may want to consider natural alternatives. However, only your licensed health care professional can advise you if a certain product is a right option for you and you must always discuss your health them. Some appetite suppressants contain stimulants (for example, caffeine) that carry risks of negative side effects. Natural Medicines Comprehensive Database (Source of unbiased scientific information) maintains a database of ingredients rated on safety. There are several all-natural appetite suppressant alternatives to the prescribed drugs on the market that are categorized as dietary supplements. Skinny Piggies are tasty appetite suppressant gummies that contain natural compounds that have been suggested to lower appetite in a number of clinical studies. Fed up with dull meals and boring diet regimens? Feelings of restriction? Having zero fun AT ALL? You may not be alone. The fact is, the majority of people don't enjoy diet meals. It's not pleasant avoiding foods you enjoy, and most definitely not fun to exercise when you'd rather just sit the armchair watching a new TV episode of Grey's Anatomy. The good news is, now you can support your diet by enjoying a unique, natural appetite suppressant supplements, Skinny Piggies! 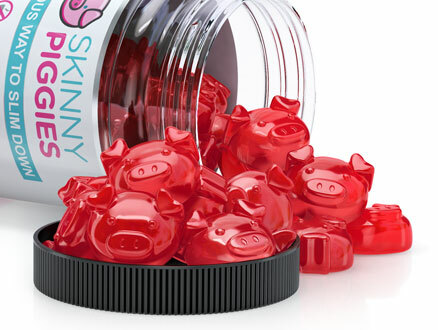 Skinny Piggies are great-tasting fruit flavored fiber gummies that combat cravings for food and your appetite while enabling your body to remain in fat-burning mode. Before we talk about Skinny Piggies good appetite suppressant gummies, let's take a look what's required for your body to start losing fat. 2) A diet plan that's fun enough that you will stick with it for a long period of time. Often times though, a large number of weight-loss plans miss one (or all three) of mentioned points. To see really good success with your program, it's critical that you eat less calories than you burn off daily. You may do that in one of two ways: increase your energy expenditure through added physical activity or cut down your food intake. If only fat loss were that easy. Though cutting back on your daily calories seems easy enough, in real life your strong cravings will most likely keep you thinking about sweets day and night. And that's when Skinny Piggies weight-loss gummies can help you! Skinny Piggies are fun, sweet healthy treats you won't need to feel guilty about! Enjoy the succulent taste of these good appetite suppressant gummies and let them do their work. So, exactly what are these gummy supplements doing for you? The idea is pretty straightforward. Hunger is caused by 2 key ways: the amount of calories you consume and the feeling of food in your stomach. After a large meal, your stomach expands in size from the food pressing on the sides, that makes you feeling full and you stop eating. When you ingest one Skinny Piggy a half hour preceding your meal with a 16-ounce cup of water, it will gently form a soft gel, that activates food receptors in the stomach, letting the brain know you ate a large meal. With this, when you do eat, you are partially full and consume far fewer calories. This way you can reduce appetite and keep your caloric intake down, without feeling like you're eating less than before. The gel allows your stomach to empty slower and that makes you full a lot longer. The sooner you feel full, the less likely you will remain to eat which allows you to reach a lower calorie intake. As the gel surrounds the food, it delays the digestion of carbohydrates and flattens your blood sugar level. By reducing sudden changes in your blood sugar you avoid those pesky sugar cravings. Avoiding blood glucose spikes helps prevent your meals from getting stored as unwanted body fat. By putting you in fat-burning mode, our good appetite suppressant gummies help you lose weight. There's no end to the choices of fat loss pills sold on the internet. From fat loss supplements to hunger suppressants, it's impossible to know what fat loss product can work best for you. Great Flavor: Very few diet products actually taste good, and almost none of them have the yummy taste of strawberry gummies, that's exactly why these gummies are a pre-meal treat you will really enjoy. No Chemicals or Stimulants: Taking a weight loss product without harsh stimulants and that's why you can take them even at night. Genuine Ingredients: Unlike most weight loss pills, it's actually possible to pronounce every active ingredient in Skinny Piggy diet supplements, so rest assured that you're filling your body with high quality ingredients. Well Balanced Nutrients: On top of helping you lose weight, they will also support the growth of stronger hair and help your skin looking younger. Losing weight is difficult, but our delicious gummies are ready to help you make the process more easy. You will love the refreshing taste of these gummies, so remembering to eat them will be easy. Skinny Piggies are a weight loss help that is fun to take.